On the day that I interviewed the Chief, I happened to drive by an incident at a local business. There were police cars everywhere and I felt assured that the interview was not going to take place. Instead, I was asked to wait, and ultimately, the chief returned to the station to meet me. He assured me that what had happened was winding down, and that he was simply assisting the officers. Days later, I found the Chief directing traffic near my home at the site of a minor traffic accident. Chief Dunn grew up in Visalia and began his career as a member of the Tulare County Sheriff Explorer program in 1981. He attended the College of the Sequoias and Fresno City and joined the Kingsburg Police Department as a Reserve officer in 1986. His career seemed to take off after that. He graduated from the Police Academy in 1988, completing his Bachelor’s Degree in Criminology in 1989 and was promoted to Sergeant. 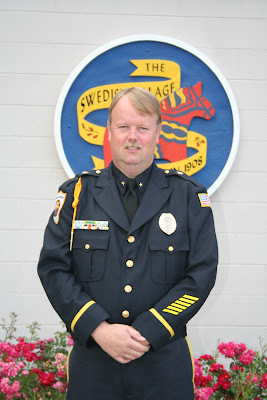 In 2001, he was promoted to Lieutenant until 2005 when he was sworn in as Chief. As it happens with small towns, people’s stories often run together. My father is retired from the Kingsburg Police Department. “It’s actually kind of interesting,” said Dunn. “I wasn’t really planning on getting a job in Law Enforcement until after graduating college. I didn’t know much about Reserve Programs, but it just so happened that I had seen an article in the newspaper that Kingsburg was hiring reserve officers. The only time that I had been in Kingsburg was once in high school to play basketball. I went to two or three places before somebody finally directed me to City Hall, which directed me to the Police Department.” He got an application and dropped it off late that night. Thirty days later he was hired. At that time, the reserve coordinator was Sergeant Jim Garcia, who ended up being Dunn’s first training officer. Typically, police departments have a famous twofold purpose which is: “To Protect & To Serve”. One might argue that the first part of that purpose cannot possibly be done with the other. “We could be doing the best job possible, but if the community thinks we’re doing the worst job, that’s how they’re going to feel, that’s how they are going act and that’s how they are going to talk about us to others, both in the community and outside the community,” said Dunn. The official letterhead of the Police Department reads: The Kingsburg Police Department is dedicated to serving mankind and safeguarding lives and property in an honest and courteous manner. To do that, the department adheres to three simple, but important values of honesty, courtesy and the use of only necessary force. If you do not run into him in town, you can contact him at the Kingsburg Police Department at 1300 California Street, Kingsburg, California. The phone number is (559) 897-2931. I had Chief Dunn as a teacher in the police academy. He is a very helpful and kind person! You couldn’t ask for a better leader for a police department! A recent post from Tara: The joy of tomatoes! Thanks for your note, Tara. We really appreciate hearing back from our readers. I have known The Chief since my dad first introduced us way back when – I have found him to be exactly who he says he is: honest, helpful, kind, etc. As a writer, he has always made himself available to me. I had the opportunity to work for Chief Dunn when he was a sergeant and then lieutenant for approximately eight years. I can tell you that all the words written about him in this article are unequiveicaly accurate. However, more importantly he’s a good man who hasn’t forgotten what our profession is all about especially during difficult times. Thanks you, Sir. I really appreciate hearing that I got the article right. He has always been very accomodating to me, and although I realize that no one is perfect, he really does seem to me to be the genuine article!